This is a postcard sent from Leopoldo (Leo) Mascioli to his son, Daniel Mascioli on December 19, 1940. 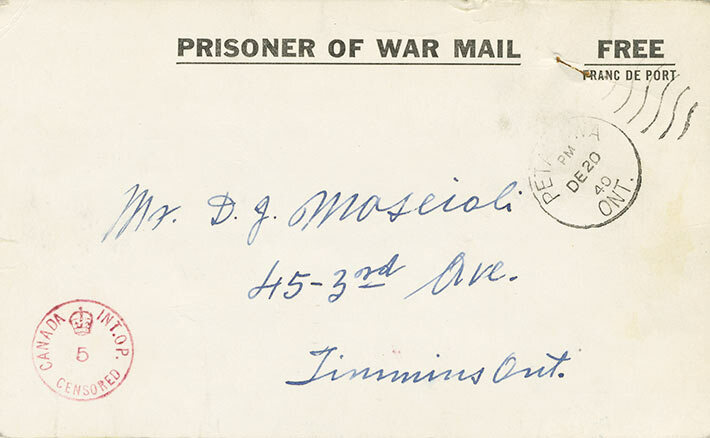 The postcard states "PRISONER OF WAR MAIL" and has "FREE" where the postage mark should be. There is a stamp that reads "CANADA CENSORED INT. OP." indicating it has gone through the Internment Operations censorship. We wrote on the 17th but it appears that whoever was responsible lost it. However, we’re not sure. In that letter I was asking what we wanted for Christmas and for precaution, I will repeat it to you, hoping that this arrives in time. Six, fourteen pound turkeys (cooked), twenty pounds of assorted nuts, a Christmas cake of 20-25 lbs., 5 cartons of cigarettes. If you send it by car, have it arrive two or three days before. I received Loretta’s letter of the 15th and yours of the 16th. Keith’s I haven’t seen. I understood everything. Have a Merry Christmas - it’s as if I were there. In the end, we are doing well and are resigned. Hello to everyone and Merry Christmas, to you, Loretta and kids.